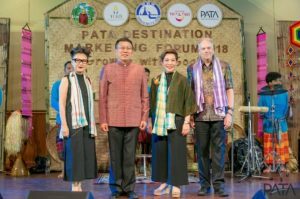 Khon Kaen (Thailand) – November 29, 2018 – The PATA Destination Marketing Forum 2018, with the theme ‘Growth with Goals’, officially began on Wednesday, November 28 attracting over 300 delegates from 25 destinations. The event, hosted by the Thailand Convention & Exhibition Bureau (TCEB) and the Tourism Authority of Thailand (TAT) with the support of Khon Kaen Province, brought together delegates from the public and private sectors for inspiring and insightful discussions on some of the major issues in marketing and managing tourism growth to lesser-known destinations. Delegates travelled from all corners of the globe including Australia, Canada, China, Chinese Taipei, Hong Kong SAR, India, Indonesia, Japan, Jordan, Kenya, Lao PDR, Malaysia, Myanmar, Nepal, Pakistan, Palau, The Philippines, Singapore, South Africa, Spain, Sri Lanka, Timor-Leste, USA and Vietnam. Mrs. Srisuda Wanaphinyosak, TAT Deputy Governor for International Marketing (Europe, Africa, Middle East and the Americas), said “This PATA event is complied with TAT’s latest campaign of “Amazing Thailand Go Local” which is a landmark project to promote the kingdom’s emerging generation of lesser known destinations as well as the Hub and Hook strategy, with the main city acting as a hub and hook to the nearby lesser known destinations. Khon Kaen is a great example of a hub city and hook to Udon Thani, Nong Khai, and Kalasin. Also, through our technical tour earlier today, Khon Kaen has shown its charm of unique culture, passed-on tradition, tasty cuisine and the true hospitality of the local people. On Thursday, November 28, delegates had the opportunity to join the Technical Tour and Tourism Marketing Treasure Hunt. They were challenged to discover the gems of Khon Kaen and the surrounding area by engaging with the culture and people of Khon Kaen, taste their food, admire the landscape and savour their history – while leveraging digital tools to identify, collect and promote their new-found travel “treasures.” The activities during the day will be incorporated into the interactive digital marketing workshop taking place during the conference on Friday, November 30. Other topics to be discussed during the conference include the ‘Status of Destination Management Around the World’, ‘The Role of Local Experiences in Destination Marketing’, ‘Managing the Disconnect between Destination Organisations and Communities’, ‘Transborder Marketing: Case Studies of GMS’, ‘Fighting Undertourism Through Innovative Storytelling’, ‘Calculating our Impact as Destinations’, and ‘Leveraging Technology to Revolutionise the Travel Space’. Delegates will hear from established and experienced industry professionals representing Art Inspire Company Limited, BBC Global News, Capilano University, E-Tourism Frontiers, Forte Hotel Group, Go Beyond Asia, Las Vegas Convention and Visitors Authority, Mekong Tourism Coordinating Office, Resonance, Swisscontact, USAID, Venture Republic, and Yaana Ventures. Founded in 1951, PATA is a not-for-profit membership association that acts as a catalyst for the responsible development of travel and tourism to, from and within the Asia Pacific region. The Association provides aligned advocacy, insightful research and innovative events to its more than 800 member organisations, including 95 government, state and city tourism bodies, 20 international airlines and airports, 102 hospitality organisations and 70 educational institutions, as well as over a hundred young tourism professional (YTP) members across the world. The PATA network also embraces the grassroots activism the PATA Chapters and Student Chapters, who organise numerous travel industry training programmes and business development events across the world. Thousands of travel professionals belong to the 35 local PATA Chapters worldwide, while hundreds of students are members of the 22 PATA Student Chapters globally. Their local activities underpins PATA’s membership in Uniting Travel, a coalition of the world’s major Travel & Tourism organisations dedicated to ensuring that the sector speaks with one voice and acts in unison on the major issues and includes ACI, CLIA, IATA, ICAO, WEF, UNWTO and the WTTC. The PATAmPOWER platform delivers unrivalled data, forecasts and insights from the PATA Strategic Intelligence Centre to members’ desktops and mobile devices anywhere in the world. PATA’s Head Office has been in Bangkok since 1998. The Association also has official offices or representation in Beijing and London. Visit www.PATA.org. Copyright © 2019 Tourism Bangladesh. All rights reserved.